Our victim this week comes from sunny California! This is his first public interview so please give a warm welcome to Scott Richards! Scott is a California-based author where he is forced to live with all of the characters in his head. Despite what you may hear shrieked into the night air, he is a sad, crazy little man. He is maintained by those familiar few for the rare nuggets he spouts on occasion. These mad ramblings are recorded, then dictated back to old, retired shoe-cobbling elves that have retired, but still like to “keep themselves busy” as stipulated per their Retired Original Union Group Home (R.O.U.G.H.) contract agreements. I was actually slow to the whole writing gig. You’d think it would be a natural fit, seeing as how even as a child I would lie awake and make up stories. When it’s your everyday, you tend to not notice it. I didn’t actually write my first big thing until maybe five or six years ago. It’s a book that will only ever exist in the bottom drawer of my desk. What it taught me, however, was that I love to write… and that I was terrible at it. I’ve spent every bit of time thereafter improving my grasp of the craft. Not a parent yet, but I will be this coming August. My plan is to stay flexible, prioritize my time, and write when I can. As it is, my writing routine is pretty fluid, and I’ve been able to write dozens of short stories and three books, so it’s effective enough for me and the way I function. Could I recommend it to other people? Likely wouldn’t. I believe every writer needs to find what’s best for them. Every writer has a method and a style. Some do best with a scheduled routine, and can’t write outside of that because they just can’t be creative. That would be death to my work. So, in the end, I guess we’ll just see how much a baby changes things, and I’ll let you know! Brandon Sanderson, big time. That man has earned my trust. Everything I’ve read of his resonates with me so much as a reader, that when I hear he has a new book out, I don’t need to know anything about it; I know it’ll be great and I’ll love it. His grasp of character building, unique magic systems, and the way he interweaves politics and religion into his plots is not only remarkable, but he does so without useless info dumping or making the reader suffer through dry political rants or religious sermons. My ultimate goal with writing is to do it for a living. I wish to be able to sustain myself with my writing. I’ve no dreams of fame or fortune, simply to write as a job. Writing is my zen, stories are how my brain is wired. Do what you love, and you’ll never work a day in your life, right? I guess we’ll see what happens! I’m actually planning a hybrid career. I enjoy the immediacy and control of self-publishing, but traditional offers an avenue that I – at the moment – am unable to reach. Hah, my journey is so fresh and so clean, clean! Despite all that I’ve written, I’ve only just recently begun to put my work out there for public consumption. Episode one of my serial Before the Shroud just went up a couple of weeks ago, and episode two comes out June 3rd. Too early to really tell success, but I’ve done my homework, made plans, studied how others have done it, so I’m hopeful. I just hope no one realizes how terrible a writer I am. I’ve got quite a few stories going on right now, so in the interest of not confusing people, we’ll stick with the serial. Before the Shroud started as an ongoing serial on my blog. I still post to it every Monday, but I’ve begun putting the parts together into episodes and have them on a weekly release schedule starting June 3rd. Six episodes in a season, and a break between seasons. The serial is part of a larger whole, but can be read on its own without knowing anything else about the lore or history. It follows the path of three characters as each discovers their purpose, and how they fit with one another. Each is believed to be a monster in their own way, but life has other plans. I’ve always been a sci-fi and fantasy buff, but when it comes to writing, I just construct the story that comes in my head. I don’t sit and think of stories, they come to me. I have two sci-fi books I’m editing and preparing to release on Amazon, I’m shopping a YA urban fantasy novel to agents at the moment, while I have a collection of short stories in this same world that can take place anywhere from 1980s America to a varied steampunkish other world with guns, nobles, and fencing. 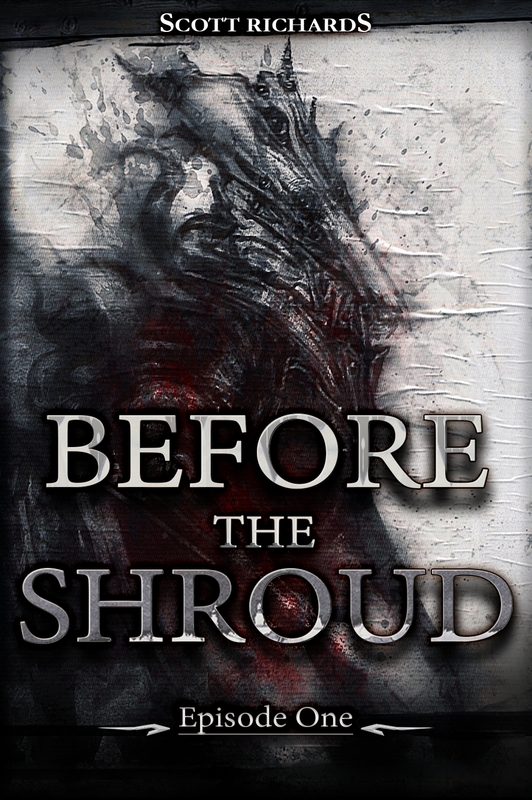 Aldester would be the primary main character in Before the Shroud. As the writer, I’m a fan of his limitations as a character. He’s young, and has had to steal to survive. That means relying on cleverness, and not so much martial clout. When it comes time for him to fight, he has to think of other ways to solve his problems. I don’t know why anyone would hate him, but readers can surprise you! I’ve had readers tell me they enjoy his antics and attitude, but as the story progresses, we’ll see if opinions change. Now there is a question. I’d say pick any Two Steps From Hell album, and you’re good. Thanks Scott for being a part and answering some questions for us! You can follow Scott on his website and pick up his book on Amazon!